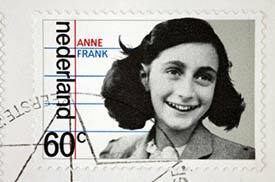 ABOVE: An Anne Frank commemorative postage stamp from 1980. This professional school has 18,000 students in 16 institutes. Its English pages have useful information on visa requirements, cost of living, etc. for foreign students in the Netherlands. The University of Amsterdam has a great deal of English-language information, although most of the university's curriculum is in Dutch. Since its beginnings in 1878, VU has emphasized "compassion with sobriety." Most programs are in Dutch, but the university does offer an International Business Administration degree in English. The ISN helps students at the Universiteit van Amsterdam find their way around the university and the city. ISA has 800+ elementary and high-school pupils of more than 40 nationalities on a modern campus where English is the language of instruction. The Prinsenhof, a budget hotel, prepared this lively guide for younger travelers. For inexpensive accommodations geared to students, see our Amsterdam Hostels and Camping pages. Scan of postage stamp: Jaap2.